Serving Clients throughout the Southern Oregon Area. 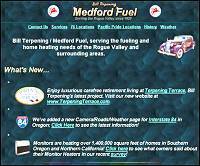 We are a locally owned and operated Rogue Valley company located in Medford Oregon, primarily providing informational web site hosting and design support for small and medium sized businesses and organizations. 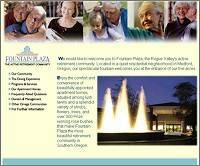 The Rogue Valley's newest retirement community is now open! 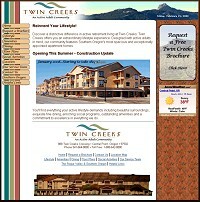 Twin Creeks Retirement in Central Point features some of Oregon's most spacious and exceptionally appointed apartment homes, with studio, one bedroom, and two bedroom apartments up to 1600 square feet. The community features a “downtown” entry with a beautifully appointed dining room, a full-service beauty and barber shop, library, technology center, hobby room, wellness center, exercise room, ice cream and espresso parlor, and theatre. Pets are welcome at Twin Creeks, with a large dog yard outside along with a spectacular courtyard complete with waterfalls and streams, and a built-in fitness trail, shuffleboard and lawn bowling. Horton Plaza is nestled in the foothills of Medford, with the perfect blending of downtown convenience and the elegance of a country estate. They are only minutes away from golf courses, shopping, cultural events and first-class medical services. Horton Plaza's site includes sections about the luxury retirement homes at Horton Plaza, Medford Oregon apartments at Horton Plaza, services and activities for seniors at Horton Plaza, Oregon retirement living information, retire in Medford Oregon at Horton Plaza, and retirement in the State of Oregon. Terpening Terrace offers the retirement lifestyle you deserve. Prestigious in style and sophisticated in service, the unprecedented quality of this Eugene resort-style retirement community is a wonderful discovery. 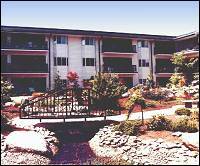 The Terpening Terrace website features sections about Oregon resort-style retirement living at Terpening Terrace, Eugene Oregon apartment homes at Terpening Terrace, Eugene Oregon information and attractions, Terpening Terrace Oregon retirement information, luxury retirement frequently asked questions, retire in Oregon at Terpening Terrace, and retirement in Oregon. They also feature a slide show of their Oregon retirement community. 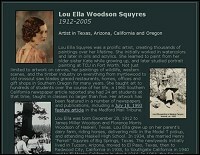 Louella Woodson Squyres was a prolific artist, working in watercolors, oils and acrylics. She was best known in later years for paintings on old saw blades. Born in Texas in the early 1900's, she learned to paint while still a young child, and continued throughout her life. From the 1960's until her going to be with the Lord in 2005, she was a resident of Medford Oregon. 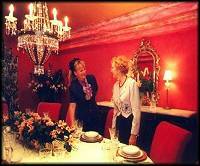 This website presents a few of the many thousands of paintings Louella created during her lifetime.